The new Arrivals Panel is a long sought after feature which was suggested and guided through by many of Praktika’s users. It combines a few requests into a single interface which, we believe, will be welcomed by receptionists, doctors and practice managers. Its main objective is to provide a highly visual interactive interface to check and change today’s patients arrival and response status. The Arrivals Panel is also accompanied by the new mouse right-click functionality on the appointment blocks to quickly change the arrival and response status. This is the first in the chain of changes concerning the appointment status handling in Praktika. It will be followed by the new treatment of appointment cancellations, the cancellation list, custom icons and statuses. The Arrival Panels can be opened and closed by clicking the arrival panels button in the top left corner of the Appointment Book. It also has a visual indicator (blinking) of how many patients have arrived at the clinic and are waiting. Once a patient proceeds to a surgery and is marked as “at the surgery” the indicator reflects the change. There is a dedicated close button on the Panel’s right side. 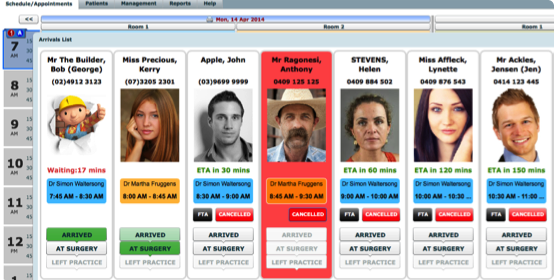 Buttons to quickly change the status: FTA, Cancelled, Arrived, At Surgery, Left Practice. Open the Panel and click the buttons that correspond to the change of the arrivals status. “Arrived”, “At Surgery”, “FTA” and “Cancelled” buttons are enabled for incomplete appointments only. “Left Practice” – available for the completed appointments only. If you need to undo the change, click again on the button you pressed. For “FTA” and “Cancelled” – double-click to reset. We have enabled the mouse right-click functionality for the Appointment blocks to facilitate the management of the arrival and patient response status. There has also been a change in the logic of what responses are available at various stages of the appointment existence. 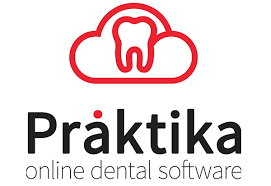 An ability to record Diagnodent exams has been added to Praktika. 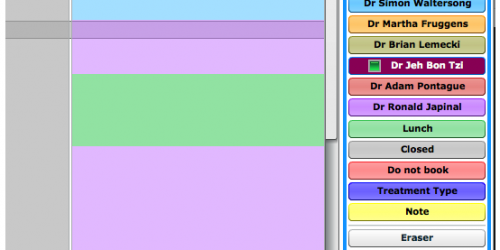 The entry data is colour coded both in the entry fields and in the oral cavity section. Switch between the fields by pressing the “TAB” button. 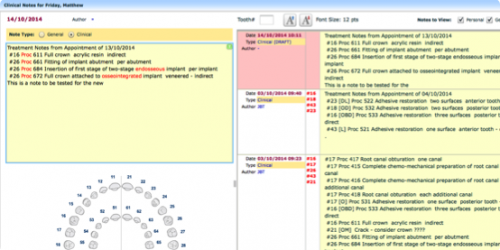 The clinical notes interface is also added at the bottom of the screen. In the Stage 2 of the Diagnodent release there will be an interface to compare several exams. Now you can import Emails into the Patient Communication file. For that save your email (including the attachments) as *.eml file and import it in the Communication section by choosing “Emails” as the document type in the Import Document interface. Double click on the email to display the content of the saved email: it should start your Mail application and show the email there. We have added a facility to record external events in Praktika. This can be done within the Communication section or at the Recalls section. It is meant to record generic important events that are not directly managed by Praktika (like SMS, emails, documents, etc.). You can record posting things, delivery failures, couriering parcels, etc. A very useful feature that is finally here. Preview image files (png, jpg), text files, PDF files immediately in the Communication Table preview window. Just select a file in the table to preview. IMPORTANT NOTE. If the Preview Window is not properly aligned, it covers the buttons or is placed outside the screen, make sure that the zoom level of your browser is set to 100%. (Ctrl + 0 or Command + 0 shortcuts usually do the trick). Pressing ESC key will close the screen if the buttons are covered.A very useful feature that is finally here. Preview image files (png, jpg), text files, PDF files immediately in the Communication Table preview window. Just select a file in the table to preview. All DMA members using Praktika can now save lots of time by importing DMA transaction files straight away to Praktika. There is a new DMA Management Tab in the Management Module to import and process the files as well as a button in the Patient Summary to show a particular patient’s DMD transactions. To see what the DMA is, please look at the end of this Newsletter. The document notes in the communication files are now editable. Just click on the note to bring up the Edit Note popup where you can modify and save the content of the note. The scan interface now allows to save and upload several images at once. If the screen contains more than 1 image, it switches the view into the multiple view mode, allows you to select the desired ones and save them with a single click.  – performance problem (significant drop in program responsiveness after some prolonged use). We will keep you informed on when Google fixes the issues and the Chrome browser becomes a recommended browser again. An investment for you and your practice. 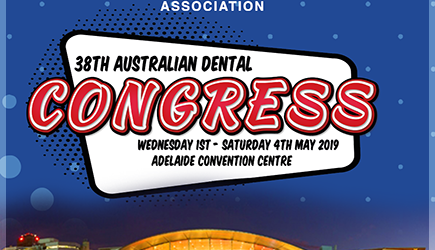 Dental Members Australia has created a model — a tool — that builds a network of sustainable loyalty between dental practices and patients. It is a network that provides patients with choices about their dental care while giving them options to spread payment over interest-free instalments. Take your practice to the next level today. Dental Members Australia (DMA) leverages technology to improve affordability of preventive dental care for patients. We can help dental practices implement their own in-house membership and payment plan programs. DMA emerged from a trend noticed at many practices. Australians were visiting their dentist irregularly and shopping for better prices. Today we’re the only membership and payment plan cloud-based software provider for dental practices and we are blazing dental practices in to limitless possibilities. Our two payment plans give patients better access to great dentistry, while promoting regular dental attendance. We believe dental payment plans using cloud technology are the future.